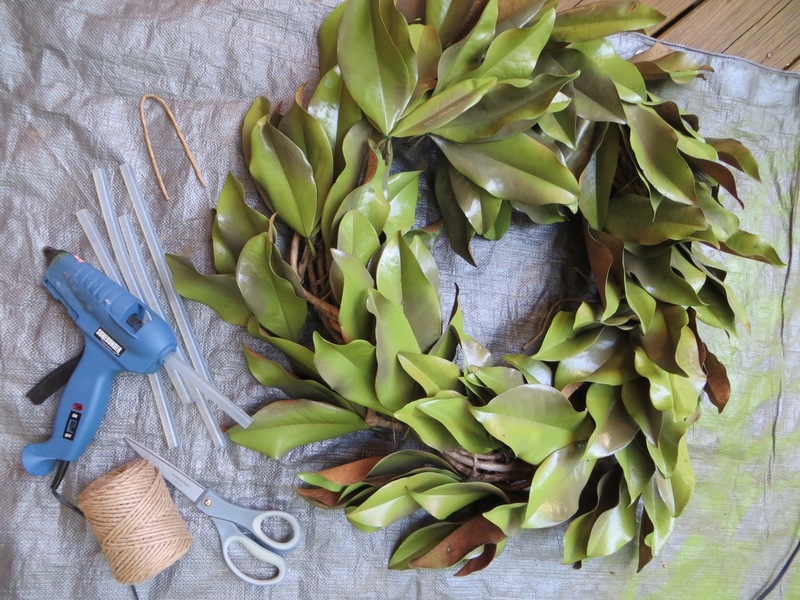 The Project Lady - How to Make Your Own Magnolia Wreath from Scratch! How to Make Your Own Magnolia Wreath from Scratch! Magnolia wreaths are so pretty, don’t you think? 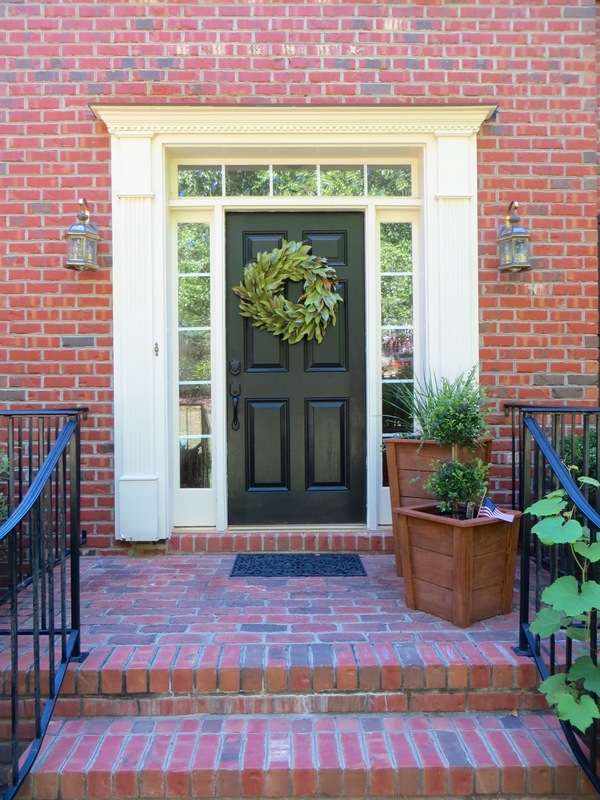 I love how big and bold they are yet so simple and classy! 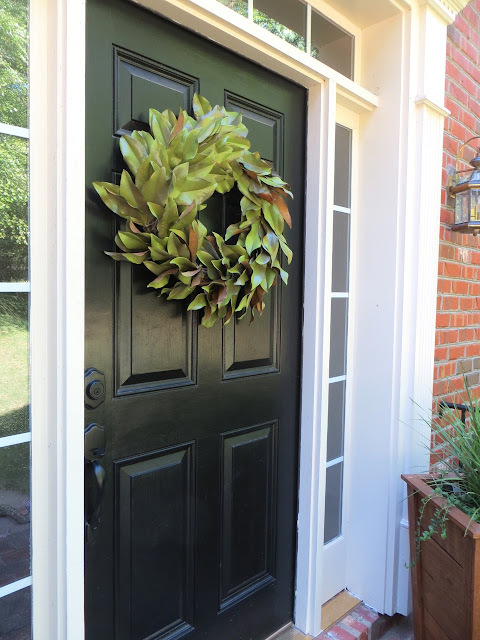 In this tutorial I will show you how I made this wreath for around $8! 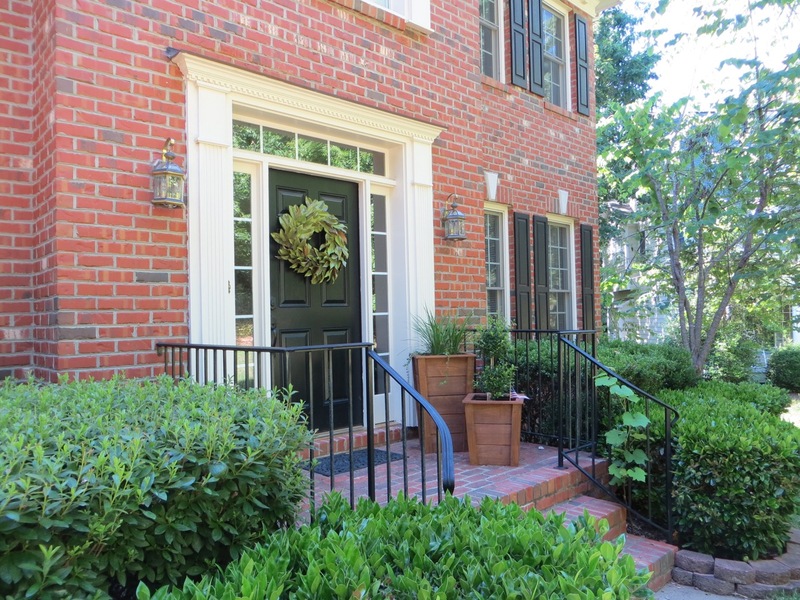 It really adds character to the front of our house! 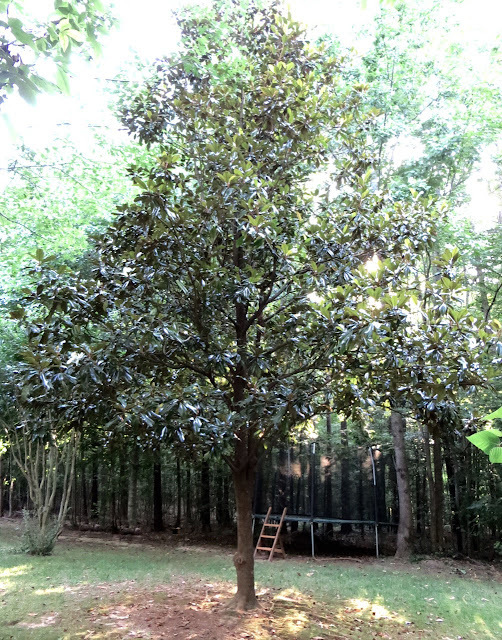 We have a magnolia tree in our backyard and each week we’ve been raking the fallen leaves and dumping them inside the chickens’ fence. 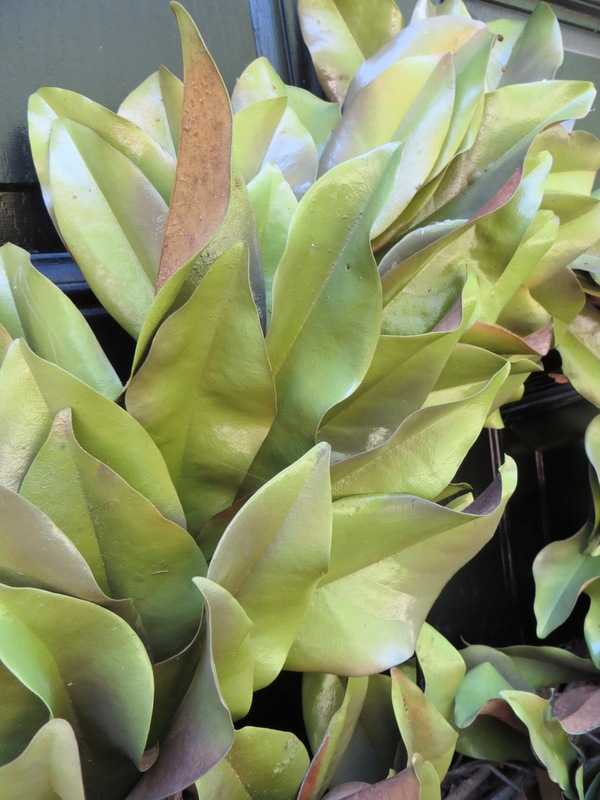 I’ve been noticing how they haven’t crumbled or disintegrated like other types of leaves. Since I’ve been on a search for a wreath ever since we moved into our house this was just what I needed – realizing that magnolia leaves are the perfect candidate for a homemade wreath! But, shhhh… I have a secret! See those pretty green leaves? They’re actually spray painted! I didn’t know what else to do – I certainly didn’t want the dry-orange color they were and spray paint has been my friend lately! Once I have an idea I want to get started right away. I grabbed a large paper bag and picked up all the leaves that were on the ground, filling it just over half-full*. 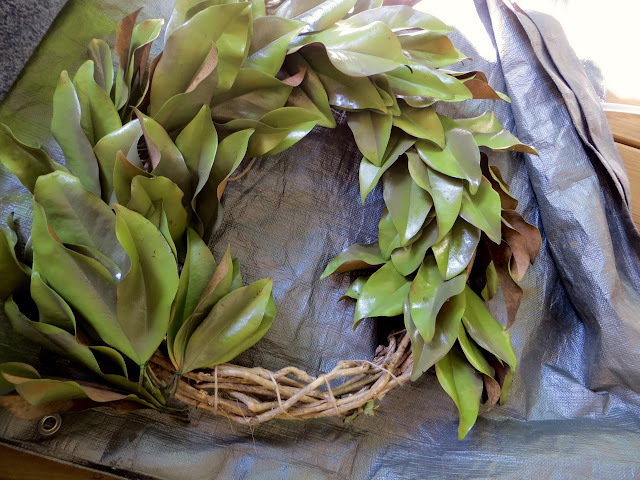 *I barely had enough leaves for my wreath with my bag 1/2-full so I’d recommend getting your bag 3/4-full to be safe! Being a little stubborn and not wanting to go to the store with the kids to buy a wreath frame I brainstormed another option. Oh, look! Right in our backyard! 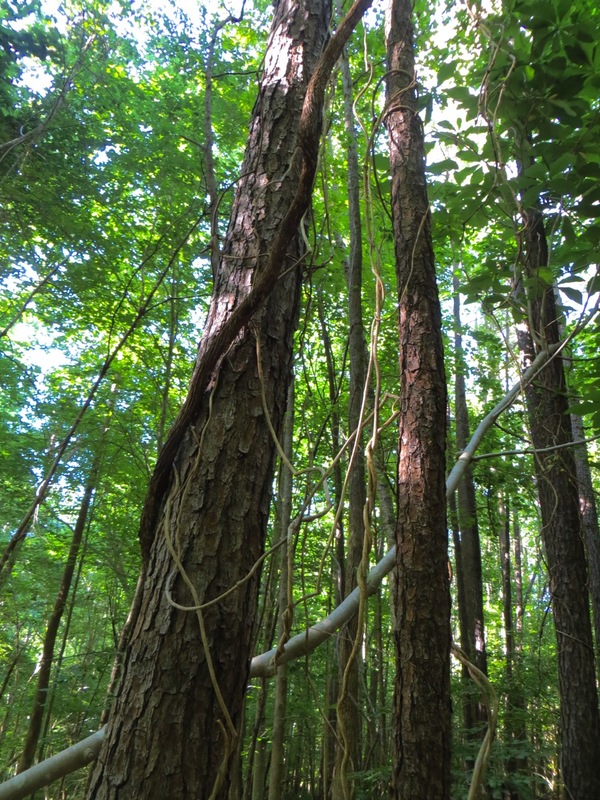 VINES! I gave a little tug and they fell right at my feet just asking to me made into a pretty decoration. I’ve never made a wreath before but I figured these were the supplies I’d need. Twine and scissors. 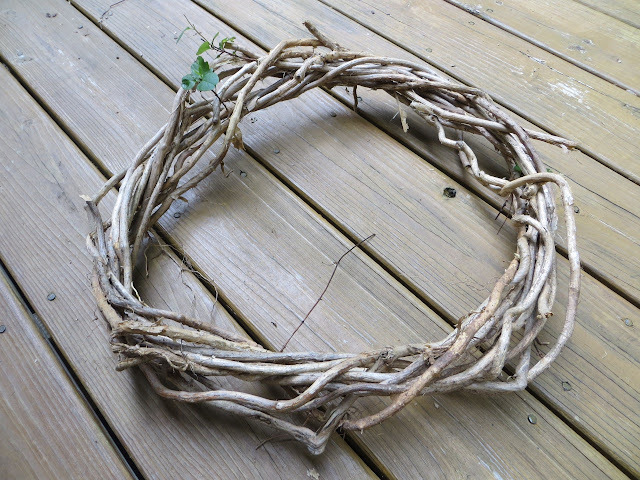 I started by wrapping a few circles in the shape I wanted then I started twisting other pieces around the circle. It was tricky at first but I found the best way to keep the vines from snapping was to go slowly and grab the end and pull it through the center, grab the end and pull it through, etc. TIP: whether you’re buying or making your own frame you’ll want it to be large (say, 14-inches across the center opening) because not only is it hard to twist vines in a smaller circle BUT more importantly the magnolia leaves are very large and would be hard to fit inside the inner curve. This looked good enough to me! 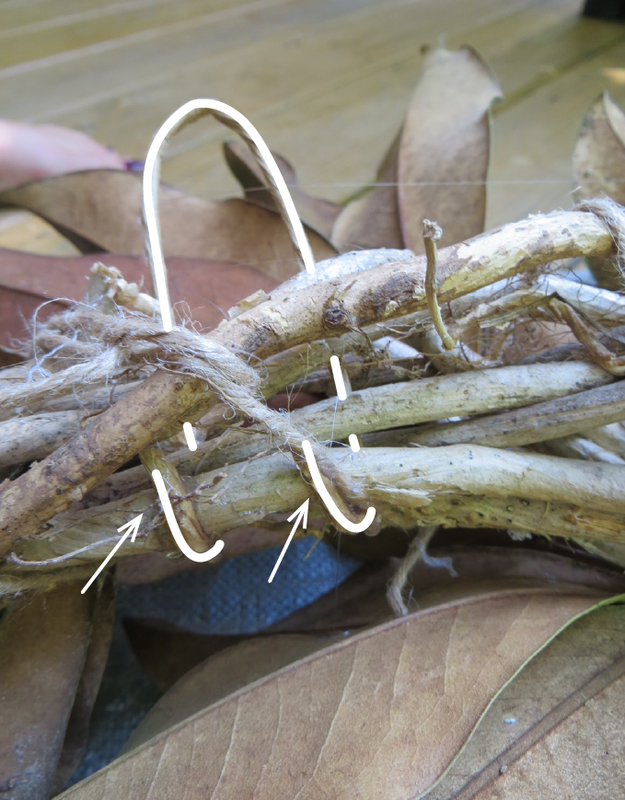 There were a dozen or so ends of vine that I needed to keep from popping out so I wrapped the twine around and around, pulling tight as I went. 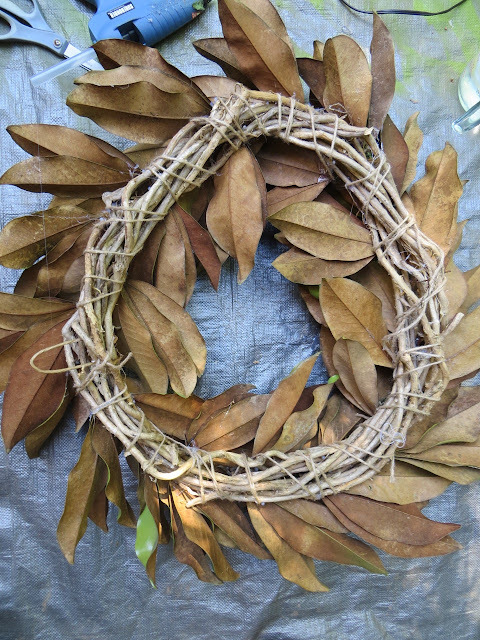 It’s a wonky-shaped frame but I wasn’t trying to make it perfect since the leaves would hide most of it. Knot the ends of your twine together to keep from unraveling. 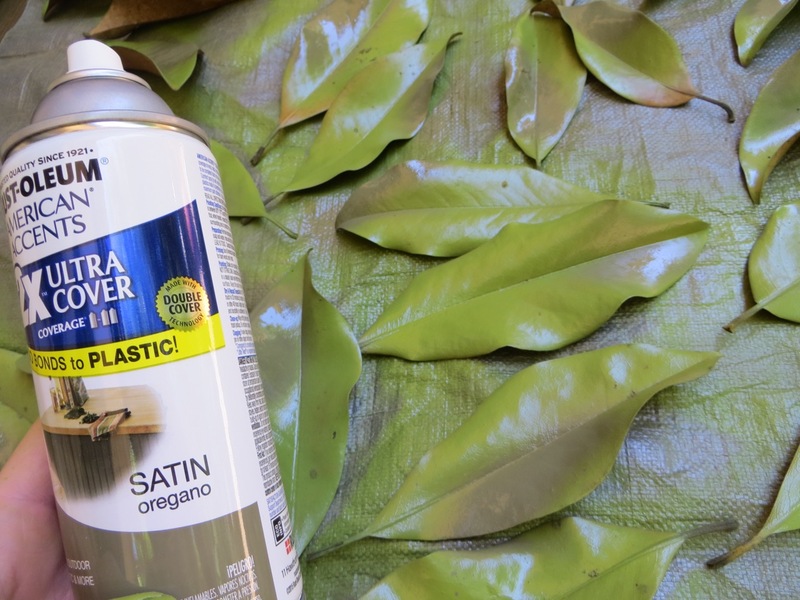 Lay your leaves out on a large surface – I keep an old tarp handy for spray-painting projects. 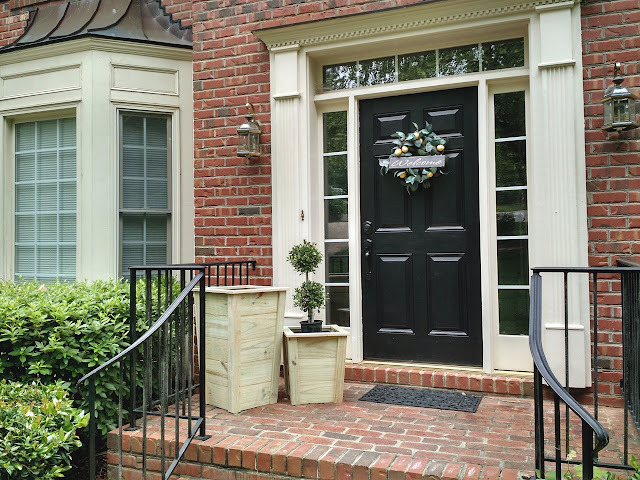 These are the 2 colors I purchased and they were just right! First I sprayed the “Eden” color over the front of each leaf. Let dry. 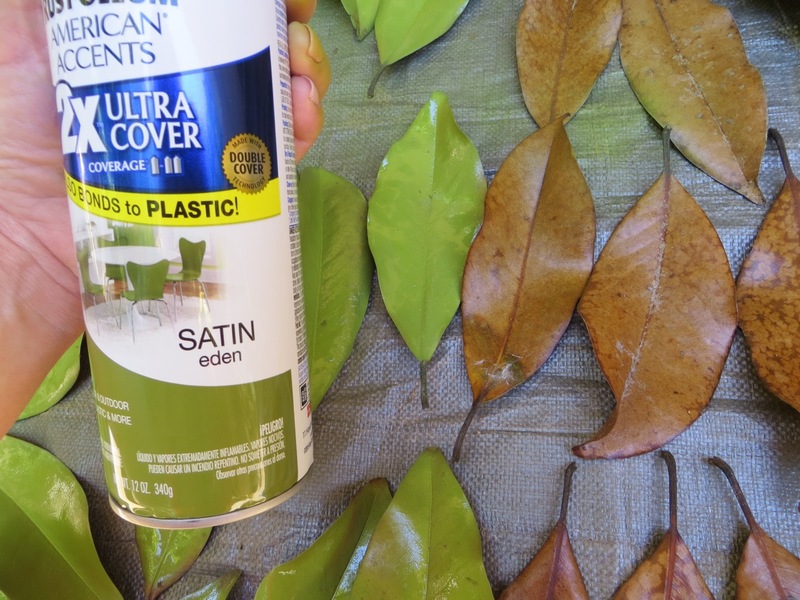 Then I quickly sprayed one edge of each leaf with the “Oregano” color to give dimension – you don’t need much – so do it fast. 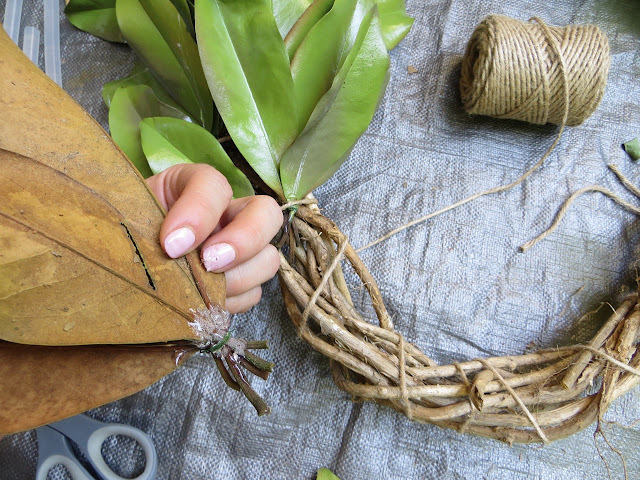 Once your leaves are dry you’ll start creating bunches and tying together with floral wire. 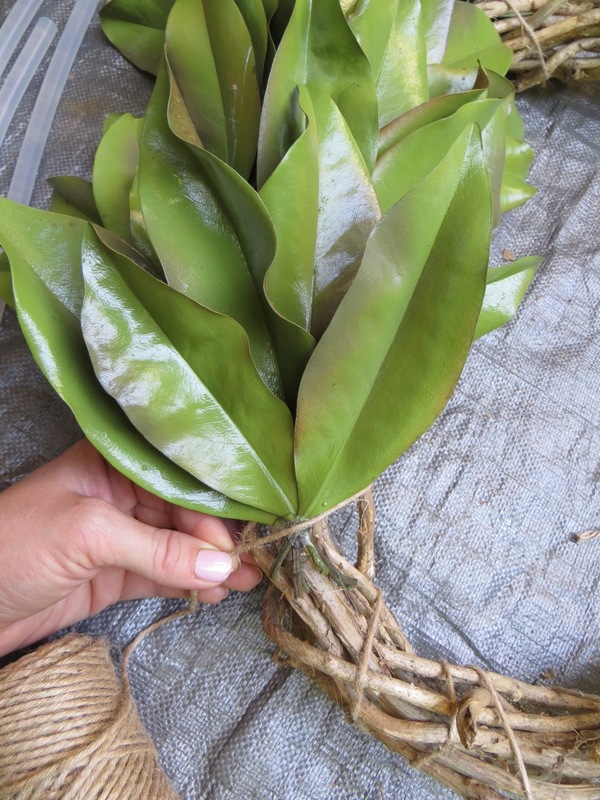 I found that a bunch of 5 works best, with 3 larger leaves in the back and 2 smaller in the front. It doesn’t have to be perfect and I didn’t take any more than a second to pick each leaf out. This project is pretty forgiving! 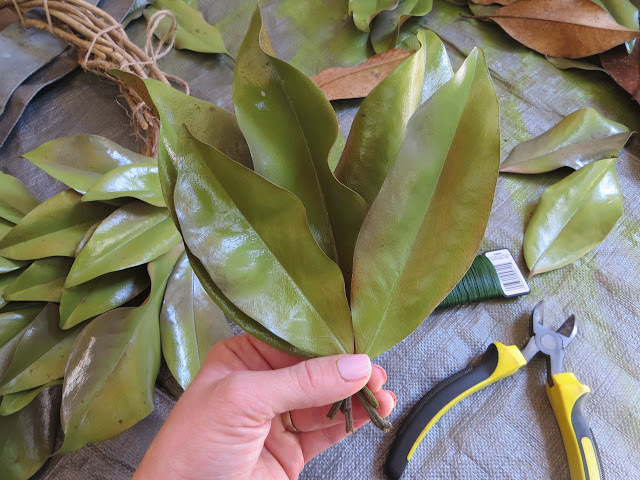 TIP: create groups of smaller leaves and groups of larger leaves. 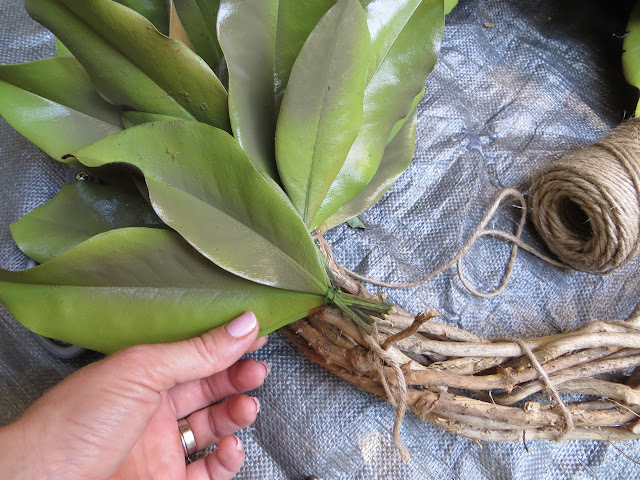 The smaller groups are best for the inner edge of the form while the larger leaves are best for the outer edge. 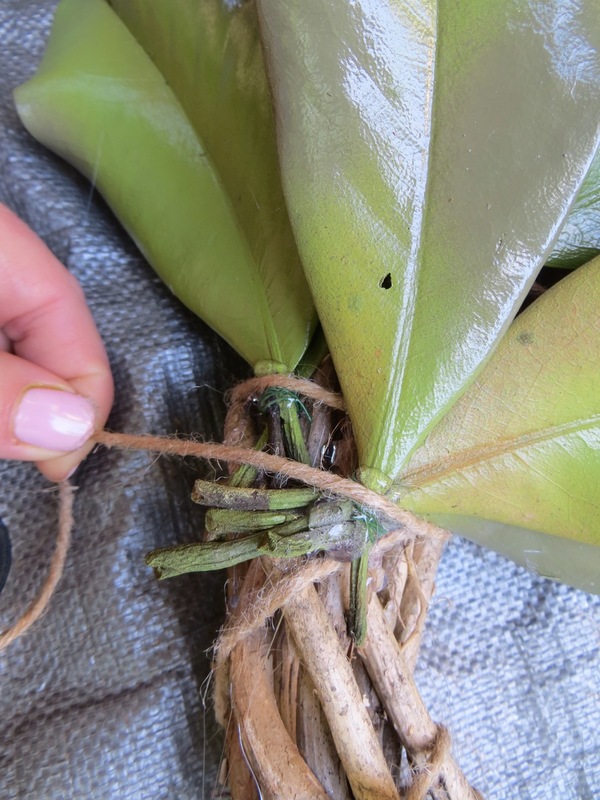 Cut floral wire pieces to about 4-inches long and wrap tightly around the base of your leaf groups. You’ll want to hold the leaves splayed out the best you can with one hand while using your other hand to wrap the wire around and around. As I tied bunches I laid them over my form to get an idea of how many bunches I needed and if I’d have enough. 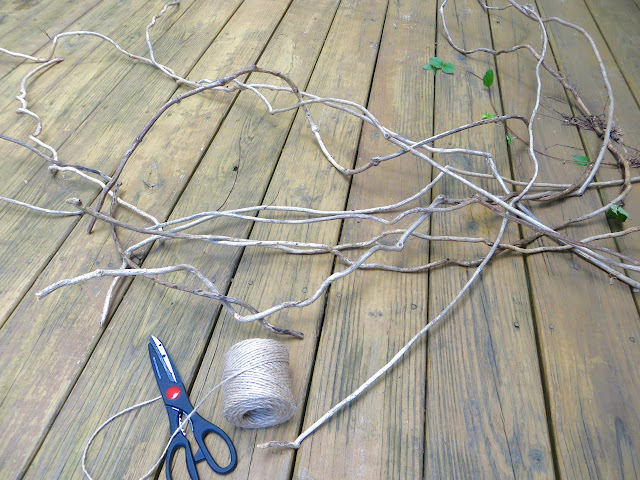 Next up you’ll need your twine, scissors, heavy-duty glue gun and lots of glue sticks. 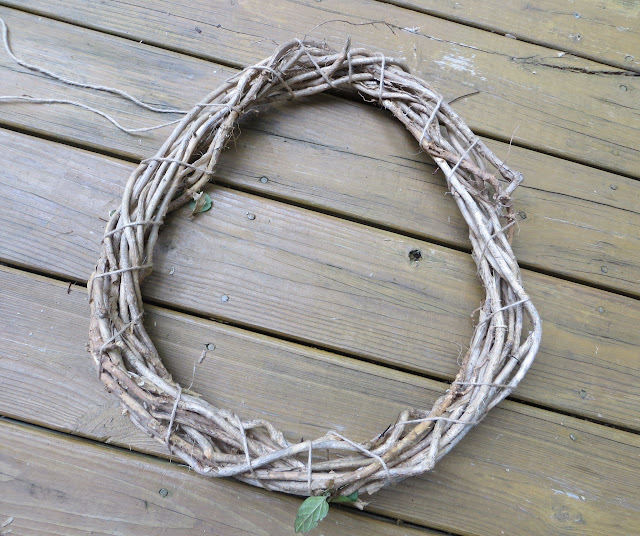 While digging for my glue gun I just happened to find a covered wire I could use for hanging the wreath (so I bent it in the shape I needed) but you could use just regular twine for hanging your wreath, too! 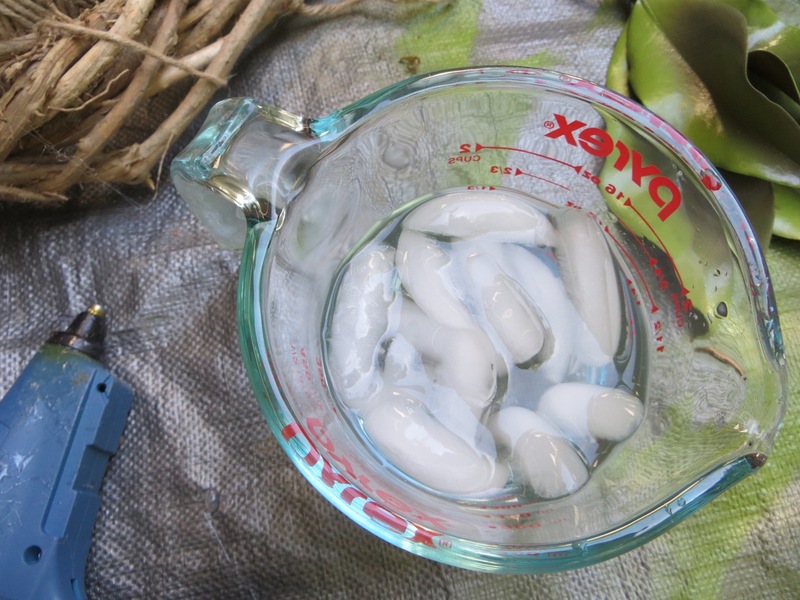 Oh yes, ice water is a must when using hot glue. I had to dip my fingers in many times – it cools the glue instantly rather than burn your skin! The method I used was placing bunches on the inside of the frame, center and then outer edge, inside, center, outside, etc. 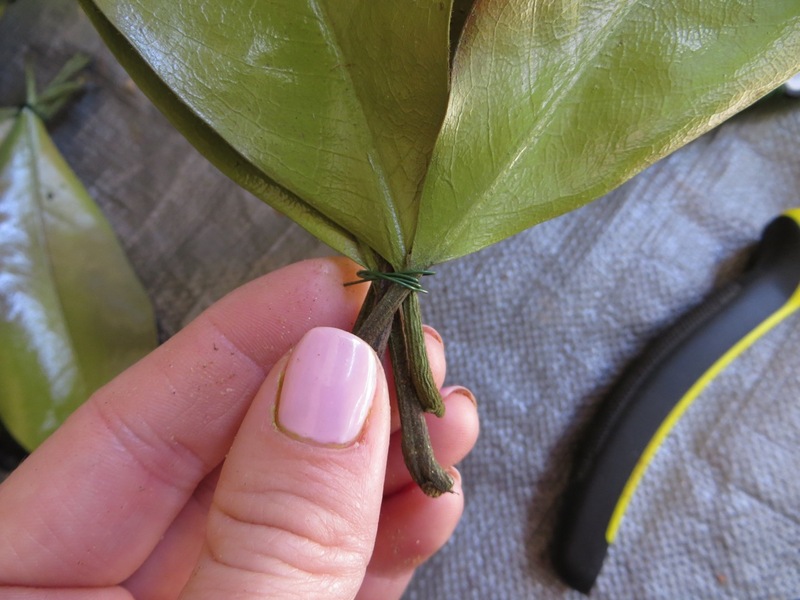 I held up each bunch to get an idea where I wanted to place it, then I put a big glob of glue all over the back of the stems and a little on the base of the leaves so they would glue in place and wouldn’t want to adjust over time. TIP: remember your bundles with smaller leaves work best on the inner edge and the bundles with larger leaves on the outer edge. 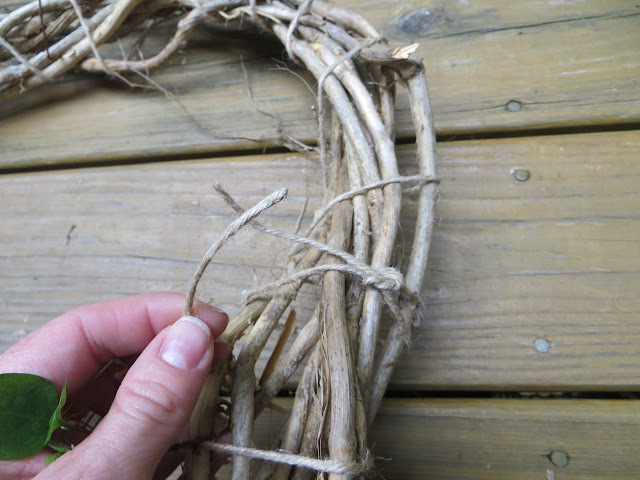 Each time I glued a bundle I put more glue on top of the stems and wrapped my twine around for more durability. Continue this process all the way around. Small bundle inner edge, wrap twine, bundle center, wrap twine, large bundle outer edge, wrap, bundle, wrap, bundle, wrap, etc. 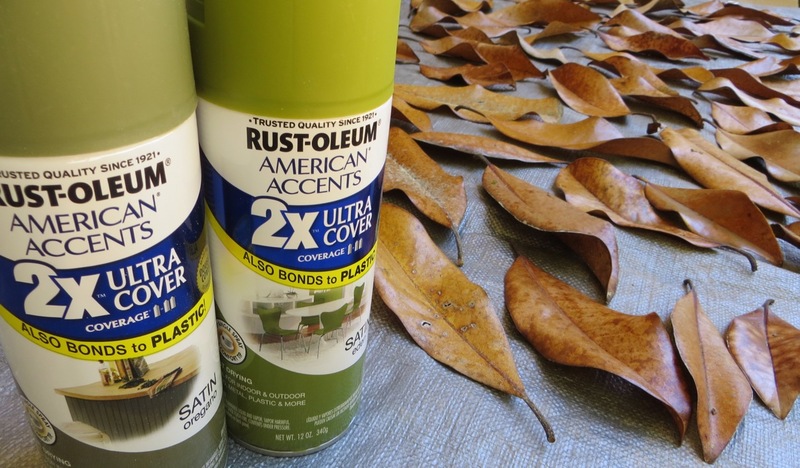 Don’t be cheap on the glue – get enough that your certain your leaves will stay in place. Here’s what my back looked like when I was finished. 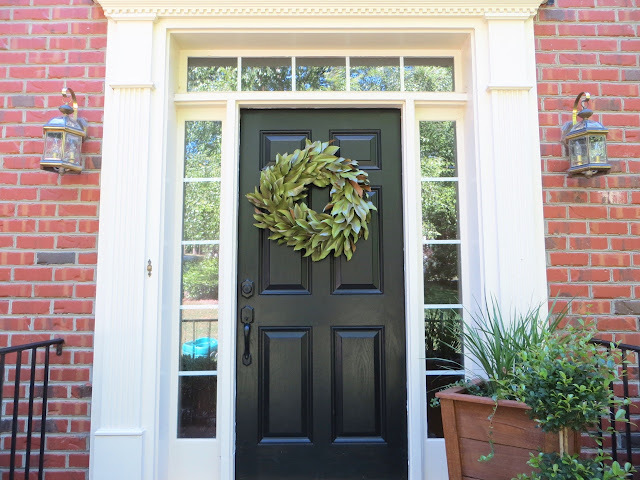 The last thing to do before you can hang up your wreath is to make something to hang it from! 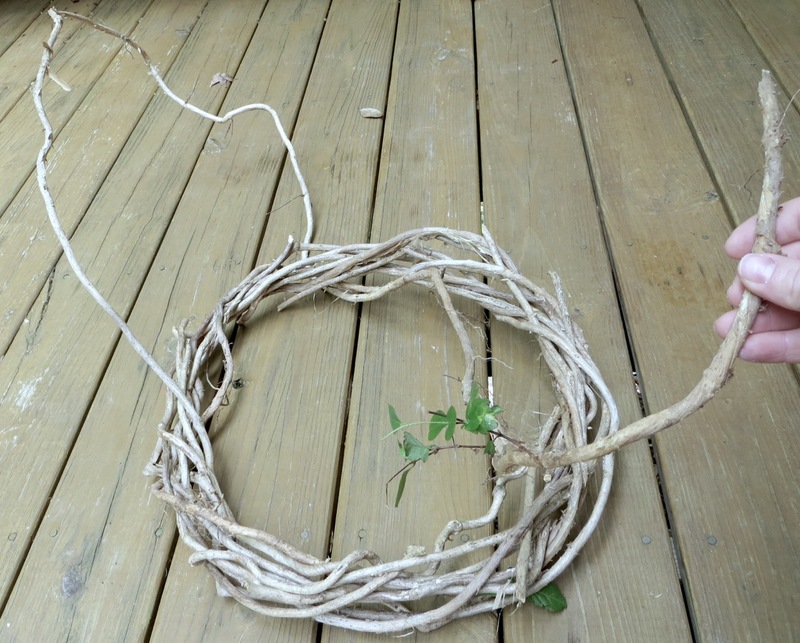 🙂 I used that covered wire I found in my craft bin to make a tall skinny ‘n’, then I threaded it through the vines on my wreath and bent the ends up to create ‘hooks’ to hold onto the vines. I put lots of hot glue on my little hanger to keep in place. I’m pretty thrilled with how it turned out! Let’s just hope the kids don’t kick their soccer balls at it and that it will last longer than a week (crossing my fingers)! PS – If you’re interested in making my plant boxes, click here! I estimate all the supplies cost about $8 for this project! That makes me want to skip around the neighborhood! See the faded wreath the previous owners left? Eek! Tutorial for Making a Pillow Cover that hides your quilts! New Family Task + Chore System / Board – Make your own! You are truly amazing! What a joy you have in your life and creativity, you make such beautiful things, truly spectacular.